The government has completed the appointment of members of the VAT Appeal Commission. The names will be unveiled later this week. The government has completed the appointment of members of the VAT Appeal Commission. The names will be unveiled this week and include a retired supreme court justice as chairman, a retired senior customs officer and a public accountant. These individuals will also serve as members of the Customs Appeal Commission. The VAT Appeal Commission will operate independently of the VAT Department and the Ministry of Finance. If a VAT registrant is unhappy with any decision made by the VAT Comptroller, they may lodge an appeal with the commission. An appellant who is aggrieved by a decision of the commission may appeal the decision, but on matters of law only, to the Supreme Court. The timing of the appointment of the commission is critical at this juncture, as enforcement activities and rulings of the VAT Department become more entrenched. The appointments are with effect from January 21, 2015. 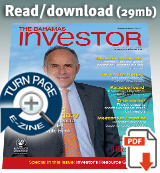 Etienne Dupuch Jr Publications Ltd is pleased to announce the release of the January-June 2015 issue of The Bahamas Investor magazine, featuring renowned international private banker Boris Collardi, chief executive officer at Julius Bår. Bahamas Prime Minister Perry Christie and a ministerial delegation left for Washington DC yesterday to participate in the inaugural Caribbean Energy Security Summit. Another Ministerial delegation, including the Minister of Financial Services Hope Strachan, will travel to Costa Rica tomorrow to attend the third summit of the Community of Latin American and Caribbean States (CELAC).